Etiquette :: Coombe Hill Golf Club welcomes visitors from all over the world to enjoy in the delight of meeting the challenges of one of Englandâ��s most highly rated and traditional courses. Whilst we welcome all visitors to Coombe, we would ask that you please adhere to the following rules whilst on the club grounds. On arrival, visitors should report to the Professional Shop to sign in. Visitors should then confirm their tee times with the Caddiemaster. (Current Handicap Certificates must be produced when signing in). Green Fees are payable in advance. Payment may be made by Sterling cheque, or by Credit Card. American Express and Diners Club Cards are not accepted. 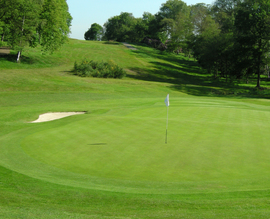 The course is a challenging test of golf and is not suitable for high handicap players or beginners. The maximum handicap for a man is 24 and a lady 28. A valid handicap certificate must be produced when signing in. Any player who does not meet the required standard will not be allowed to play.